The Birmingham Post isn’t always able to post online everything that I’ve written for its print edition, so – after a suitable time lag (you should really go out and buy the paper!) – I’ll be posting my recent reviews here. As per the print edition, they’re all fairly concise – just 250 words. This is of a performance at Wolverhampton Grand Theatre on 14th April 2015. English Touring Opera has form with Donizetti, and it was director James Conway’s production of Anna Bolena that first convinced this born Wagnerite of Donizetti’s power as a musical dramatist. So we had high hopes for Conway’s adaptation of The Siege of Calais. A defensive programme essay from Conway triggered some doubts. Act 3 was omitted outright and its material largely redistributed elsewhere. Conway’s intention seems to have been to throw the focus onto the moments when Donizetti’s patchy, bel canto-by-the-yard score comes up to the level that the drama demands; moments in which Conway and his company clearly believed passionately. 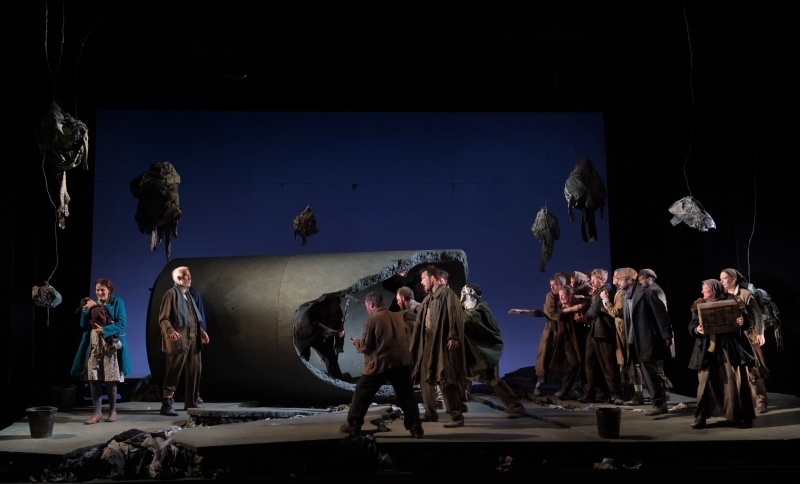 Samal Blak’s set created a timeless atmosphere of war-torn desolation, and in that handful of inspired numbers – most notably the extended finale, when the six burghers of Calais volunteer to die for their fellow citizens – this production worked nobly on its own terms. Throughout the excellent cast, characterisation was naturalistic and affecting. Craig Smith was a craggy, dignified Eustachio, while Paula Sides as Eleonora and Catherine Darby in the trouser-role of her husband Aurelio both stood out vocally. Their poignant Act 2 duet was a high point – as was the way Darby’s voice gleamed through the glorious sextet that preceded the burghers’ final march to their fate. The orchestra, under Jeremy Silver, did wonderful things with Donizetti’s woodwind writing; in fact, the only real problem with this production (if you can accept Conway’s rewrites – this is hardly William Tell, after all) was Donizetti himself. It’s always refreshing to see a rarity done with such conviction, but it was hard not to wonder what ETO might have achieved in an opera that the director believed to be stageworthy as written.